KUSA — A neighbor’s call to 911 started the investigation into the whereabouts of 68-year-old Charles Frary -- or Chuck, as his family knew him. Ten days after that 911 call, Chuck’s own children filed a missing persons report. But the effort to find the missing man dragged on for more than a year in the midst of miscommunication between city agencies and a lack of preparedness to handle what they describe as Denver's worst hoarding case on record. The search for Chuck never extended far from his home. Turns out, it didn’t need to: 383 days after that neighbor’s call for help, Chuck’s remains were discovered in his living room. His autopsy revealed his body had mummified. He was likely dead in his home all along. 9Wants to Know’s investigation “BLAME: Lost at Home” follows the paths police and residential health inspectors took -- and didn’t take -- when searching for Chuck. They repeatedly delayed the search, citing a lack of proper protective gear that was not ordered for 12 months after police first entered the home, according to city records. 9Wants to Know learned of additional details from neighbors and family members that apparently went overlooked by police investigators -- details that Chuck’s children feel could have provided insight into how their father became lost at home. 9Wants to Know examined records from the Denver Department of Public Health and Environment and city police to investigate why it took the two city agencies more than a year to find this man’s body in his own living room. City records show that Chuck Frary’s home at 4401 W. 50th Ave has been on their radar for at least a decade. In 2007, the department opened the first case looking into the house after receiving a complaint that parts of the wood exterior were falling apart. The records show the city came to no conclusion. The case was open nearly a year, but records show very little was ever done to improve the inside or outside of the home. The records do not indicate that the city ever made contact with Chuck during that time. Chuck Frary’s children said their father showed increasingly severe signs of mental illness over the last 30 years and pushed them away. They rarely, if ever, were allowed into their father’s house. In May 2012, the city opened another case regarding Chuck Frary’s house after a member of Neighborhood Inspection Services filed a complaint alleging “bad living conditions,” with no additional detail included in the report. The case was closed in June 2013. The next time the city’s public health department was contacted about Chuck Frary’s house was in October 2017. The request came from a Denver police detective, who indicated he already believed Frary was dead inside, and likely buried in trash. That was eight months after police records show one of Chuck Frary’s neighbors, Cheryl Lanaster, called 911 asking for someone to check on Chuck on Feb. 4, 2017. “I don’t know if he’s gone, or died, so that’s why I called,” Lanaster told 9Wants to Know. Police responded to the call, with help from the fire department. Denver police Cmdr. 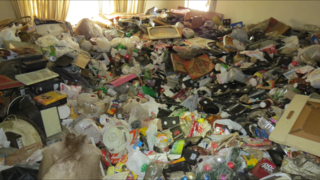 Barb Archer said the officers had difficulty entering the home because the doors were forced closed by large amounts of apparent trash and debris. Denver police determined that the house was too full of debris to do any further investigation inside the home at that time. It’s unclear whether they spoke to other neighbors, and the family said no one was contacted by police about this Feb. 4 incident. Instead, one of Chuck’s son’s, Brian Frary, told 9Wants to Know a man who identified himself as Mike Galusha was the first person to inform Chuck’s children that the 68-year-old was missing or may be dead. That visit prompted the family to call police. They returned to Chuck’s house on Feb. 13, 2017, and again the next day to help the family look around. The family filed a missing person’s report. Again, officers chose not go deep inside the home due to the amount of garbage but apparently did open the door to look around. Family members, however, say they entered the living room, where Chuck’s body was ultimately discovered but did not see him. Despite the condition of the home, police did not contact the Denver Department of Public Health and Environment in February 2017. Instead, city records show that police did not attempt to contact DDPHE until the following July. However, the detective called the city’s helpline, 3-1-1, and the director of public health inspections, Danica Lee, said her office did not receive that information. “You guys never received that call. Any explanation about what happened there?” 9Wants to Know reporter Jeremy Jojola asked. “No I wasn’t able to find any information about what occurred there,” Lee said. "So I guess there was a black hole that happened between the detective, 311 and your agency then,” Jojola said. “I can’t speak with a whole lot of certainty about what might have happened,” Lee said. It wasn’t until October that Denver police and residential health investigators connected on Chuck’s case for the first time. Denver police and health inspectors entered Chuck Frary’s house on Oct. 26, 2017. Despite some in-depth notes included in city records, both police and city health investigators agreed that this search was not a thorough search of the house. The city posted an order to vacate outside the house calling the residence unfit for human habitation. Investigators determined that they would return later with more protective equipment. It wasn’t until Feb. 16, 2018 -- more than a year after police first entered Chuck Frary’s house, city records show -- that the protective equipment was “reviewed and ordered.” The next site visit was scheduled for Feb. 22. On Feb. 22, residential health investigators and police found Chuck’s body in his living room after approximately 30 minutes of searching, according to a public health inspection records. Chuck Frary’s remains were removed by the office of the medical examiner the next day. For more than a year, Chuck Frary’s missing person’s case remained open, finally converted to a homicide case when his remains were identified by the Office of the Medical Examiner in the days after his body was located. “Do you think this case was handled well?” 9Wants to Know reporter, Jeremy Jojola, asked Lee, of the Denver Department of Public Health and Environment. Which is why, neighbors and family said, they reached out to the city at multiple points throughout the last year, asking about the status of the investigation and the whereabouts of Chuck.